Tradition meets innovation on the Westerdam. Enjoy an unforgettable ocean voyage onboard this premium cruise ship. Westerdam provides a traditional cruise experience that hearkens back to the golden days of ocean lining. She provides just enough modern amenities and technological advancements to provide a comfortable cruise experience, while still maintaining an authentic vintage vibe. Guests will appreciate the commitment to cruise traditions such as Afternoon Tea and Gala Night while reveling in the classic architecture and vintage décor. Attracting a customer base of mature adults, the Westerdam is the perfect ship for a relaxing, sophisticated vacation at sea. 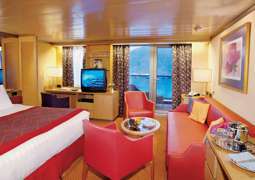 The Westerdam sails primarily to popular locations in the Caribbean and Central America. In the summer months it cruises along the West Coast to Alaska, changing locations via a Panama Canal crossing. It is most popular for shorter to mid-length cruises, ranging from 7 to 14 days. Experience true comfort in the ms Westerdam’s premium staterooms. 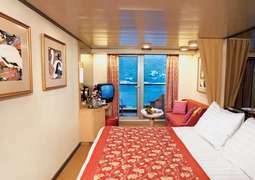 Each stateroom features luxurious bedding, a table and chairs, and a small sofa for relaxation. Suites contain a number of additional amenities, such as full-sized whirlpool bathtubs, premium bedding and bathrobes, and complimentary beverage services. Interior rooms start at 150 square feet, with veranda rooms ranging from 212-359 square feet, balcony included. 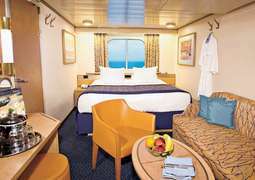 Guests looking to be spoiled on their trip will not be disappointed – every stateroom features ice service, shoeshine service and a nightly turndown service, with suite passengers receiving laundry service, a 24-hour Concierge Service and in-suite dining. Food is one of the main highlights of any Holland America cruise. The ms Westerdam is known for the high quality of its culinary options, with food in the main Dining Room being so good, you won’t need to pay for specialty dining to enjoy a five-course, gourmet meal. For three meals a day and afternoon tea, the Dining Room serves up quality dishes made by master chefs. There’s even a specialty menu with artfully-crafted vegetarian, vegan and gluten-free options. Foodies won’t want to miss taking part in America’s Test Kitchen, a popular culinary program based on the real test kitchen in Massachusetts. Passengers can watch a professional cooking show, learn about the chefs’ signature scientific approach to cooking, and even take part in a hands-on workshop to hone their culinary skills. With a strong focus on traditional cruise amenities, Westerdam also features two swimming pools, onboard shopping, and a fitness center and sports courts. The Greenhouse Spa & Salon is the perfect place for a relaxing massage or a luxurious beauty treatment, and an onboard art collection gives passengers a glimpse at the golden age of Dutch painting. Holland America cruises typically have a dress code ranging from daytime casual to smart casual, with swimwear only allowed at the pools and sun decks. Guests use the Gala Nights as an opportunity to dust off their finest tuxedos and ball gowns, although suits and dresses are also acceptable. For those who prefer not to take part in the festivities, the buffet has a casual dress code every night, and in-room dining options are also available. The Westerdam is the third ocean liner in Holland America Line’s series of Vista-class cruise ships. The stunning ship was christened on 25 April, 2004 in Venice, Italy by famous Dutch actress. 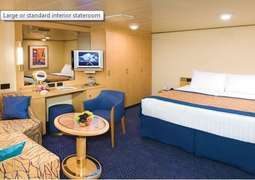 Carrying up to 1,916 ship guests and 810 staff members, she provides exceptionally much space per traveler. Westerdam recently underwent extensive brand enhancements to the tune of $300 million, therefore 2017 Europe season has been welcomed with new entertainment and dining venues. Sail on this family-friendly ship to the Caribbean islands, Hawaii, visit Alaskan fjords and other memorable destinations. The ship has seven formal to casual dining options, all featuring an impeccable service and superb food. The eateries on boards are elegant yet spacious, featuring a range of menu choices. With so many delicious options, the hardest part is choosing where to dine tonight! The Lido Market offers relaxed buffet-style breakfast, lunch and dinner. Simply enjoy a light and casual alternative. Head to the Pinnacle Grill to enjoy juicy steaks and seafood dishes. Do not miss the chance to try some traditional Italian meals with the freshest ingredients at the Canaletto restaurant. Additionally, there are pool-side snacks, burgers, Mexican food, and a café. Take a deep breath, relax and start to enjoy your unique cruising experience as soon as you enter The Culinary Arts Center, presented by Food & Wine Magazine, where you can take gourmet cooking lessons taught by Holland America’s Master Chefs. Foodies will love it! Evenings onboard are filled with an abundance of talented vocalists, dancers, illusionists, comedians and variety acts. The Greenhouse Spa & Salon invites you to enjoy heavenly beauty and wellness rituals. Westerdam is a perfectly-calculated mixture or energy and tranquility.